Why come to Sweden? Why leave homes and go on a perilous journey? The report “This is Who We Are” is the result of an in-depth survey on Afghan unaccompanied and separated children under 18 recently arrived in the country. The exercise was conducted by UNHCR with the support of JIPS. The profiling exercise provided evidence on the background of unaccompanied Afghan children coming to Sweden in order to strengthen policy and response for this vulnerable group. It looked into the events that caused them to leave their homes and their reasons for coming to Sweden. It further analysed the challenges and protection concerns interviewees faced en route. and to help prepare for training and data collection activities. The study shows that the majority of the Afghan children interviewed in Sweden are of Hazara origin. Most had only completed primary school, while two-thirds reported they had worked for more than six months in the past year. The Afghan unaccompanied minors stressed that they had primarily left their countries of main residence for protection reasons (conflict and violence, discrimination and lack of documentation). En route, they reported experiencing acute distress and severe protection incidents. The UASC’s journeys were financed mainly through borrowed money. They chose to apply for asylum in Sweden, as they perceived that Sweden offers good education opportunities, respects human rights, has a fair and efficient asylum procedure, and provides opportunities for economic development. The report launch event that took place on October 25, 2016 was well attended by a wide audience of representatives from government institutions as well as the civil society in Sweden. 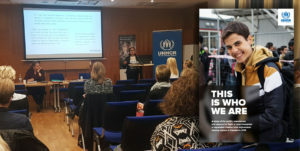 As a follow-up to the event, UNHCR held a seminar with actors engaged in child protection to address existing gaps in the reception of unaccompanied and separated minors based on findings generated through the profiling process. The seminar opened up a dialogue about creating a holistic child protection system in Sweden. Results will also be presented at the upcoming High Commissioner’s Dialogue in December in Geneva. The positive reception of the report in Sweden generated further interest among Nordic countries in the need to profile recent arrivals of unaccompanied and separated children. JIPS is currently discussing with the UNHCR Regional Representation in Northern Europe to support similar processes in neighbouring countries. More on the Sweden profiling exercise.